Sutter and Canine Companions have collaborated since 2002, when a Canine Companions facility dog began working with patients at Sutter Health’s Alta Bates Summit Regional Acute Rehabilitation Center. 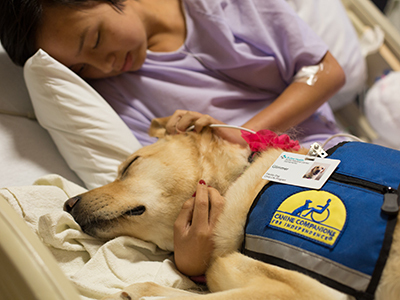 Today, nine Canine Companions facility dogs work alongside their handlers at Alta Bates Summit Regional Acute Rehabilitation Center in Oakland, Sutter Roseville Rehabilitation Institute, Sutter Neurosciences Medical Group in Sacramento and the Sutter Children’s Center, Sacramento. We're thrilled to know that our facility dogs working at facilities within the Sutter Health network are making such a positive impact.